What comes before Income Tax? Whitechapel Road, of course. It turns out that WHAT POLICE HEARD, when mixed "about", gives WHITECHAPEL ROAD, the answer. Although it's not number one on my list, this is probably the most perfect clue, and I take my hat off to the setter. 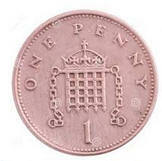 A one-penny coin, with portcullis.